If you can Get yourself to Harvey Nichols tomorrow.. 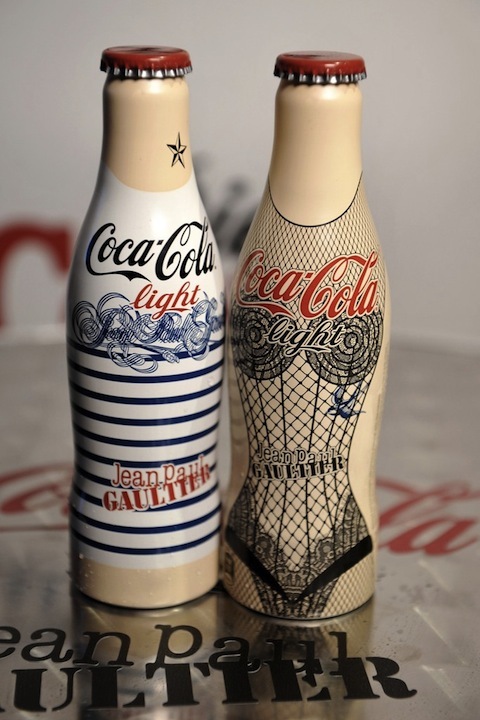 The Jean Paul Gaultier & Diet Coke bottles have been unveiled! Both iconic designs are available exclusively at Harvey Nichols nationwide Monday 16 April!Jean Paul Gaultier is the new creative director of Diet Coke in Europe. His first order of business? Decorating the iconic bottles with corsets to make them look more like his signature torso-shaped perfume bottles. Jean Paul Gaultier has designed two new bottles for Diet Coke, named ‘Day’ and ‘Night.’ The designs feature a black corset and his signature Breton stripes. The stylish bottles will be available for sale in Harvey Nichols stores across Britain starting on April 16.A third bottle, ‘Tattoo,’ will be released later in 2012. Gaultier joins the ranks of other fashion designers who have renewed the Diet Coke bottle, including Karl Lagerfeld, Matthew Williamson and Roberto Cavalli. Can't Wait to get my hands on these !